(AUSTIN) —Governor Greg Abbott and Lt. Governor Dan Patrick both reemphasized their determination to solve the state's public school finance system, including property tax reform, as each man officially began his second term of office. Abbott and Patrick took the opportunity of their oath of office ceremony on a cold and cloudy day in Austin to lay out their priorities for the 86th Legislative Session before the assembled crowds on the north lawn of the Capitol building. "I want to make this very clear," said Abbott. "We're going to do this session what no one thinks we are capable of achieving. We are going to finally fix school finance in Texas." Both were reiterating a promise they made alongside newly elected House Speaker Dennis Bonnen at a press conference last week, to work together to find a solution to one of the most complex and controversial issues in state government. Cooperation was the theme of Patrick's address, both across party lines and between the two chambers. 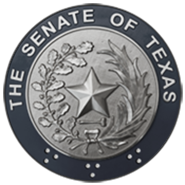 He was introduced by Flower Mound Senator Jane Nelson and Houston Senator John Whitmire, each the longest serving Republican and Democrat, respectively, in the Senate. Patrick said he asked these two members to introduce him to demonstrate his commitment to find a solution for education funding that crosses the aisle. "In Texas we're different," he said. "We work together for the people of Texas because that's what you expect us to do. The elections are over...for right now, and for the next 140 days, you expect us to do the work of the people." The Senate has already set aside billions for education and property tax reform in the proposed budget filed by Nelson, who also chairs the Senate Finance Committee. The Senate's version of the budget includes $3.7 billion to pay for a $5000 across-the-board pay raise for all public school teachers. It also earmarks $2.3 billion to reduce reliance on the current "Robin Hood" system of recapture, where property wealthy districts remit some property tax money to the state to be redirected to poorer districts, contingent on enabling legislation. Also filed on Tuesday was the supplemental budget bill, which totals $4.2 billion to balance difference between what lawmakers budgeted for 2018 and 2019 last session and actual expenses and revenue. The proposal would draw more than half of that, $2.5 billion, from the state's Rainy Day Fund, and would cover Harvey-related disaster recovery and shortfalls in the state's Medicaid program and employee and teacher retirement fund. The Senate will reconvene Tuesday, January 22 at 11 a.m.